Freedom of speech, one of the most hotly contested issues in America, has entered a new battleground: cyberspace. The very qualities that make the Internet an ideal tool for communication are those that facilitate the exposure of children to potentially harmful material, typically protected for adult use under the First Amendment. 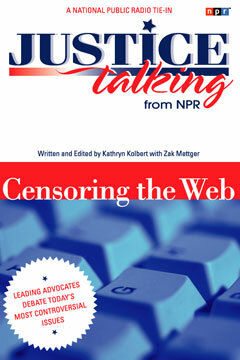 Now, in the first volume of a remarkable new book-and-CD series published in conjunction with National Public Radio’s acclaimed Justice Talking program, Nadine Strossen, president of the American Civil Liberties Union, goes head-to-head with Bruce Taylor, executive director of the National Law Center for Children and Families, in a debate about web censorship. Moderated by the popular NPR host Margot Adler, this is a thoughtful, informed discussion of an emotionally charged subject that doubles as a primer for those who want an engaging and accessible way to get up to speed on this cutting-edge issue. The compact disc contains the complete audio recording of the debate; the accompanying book contains the transcript, along with a history of related First Amendment law and a comprehensive overview of the arguments for and against the Communications Decency Act, and other laws regulating sexually explicit material on the web. The books also contain a range of supplementary primary source documents.